Initial clinical trials were in 1977, in a form solubilised in cremophor EL, but due to anaphylactic reactions it was withdrawn from the market. It was subsequently reformulated as an aqueous emulsion in intralipid and re-launched in 1986 by AstraZeneca with the brand name Diprivan. 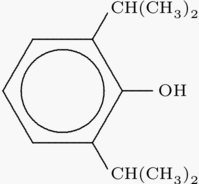 The current preparation is 1% propofol solubilised with 2.25% glycerol, 10% soybean oil and 1.2% purified egg phospholipid, and has a pH between 6.0 and 8.5 and a pKa of 11. Diprivan contains EDTA as an antimicrobial agent. Newer generic formulations contain sodium metabisulfite or benzyl alcohol. It is highly protein bound in vivo and is metabolised by conjugation in the liver. Its rate of clearance exceeds hepatic blood flow, suggesting an extrahepatic site of elimination as well. Its mechanism of action is uncertain, but it is postulated that its primary effect may be at the GABA-A receptor. Aside from the hypotension and transient apnea following induction doses, one of its most frequent side-effects is pain on injection, especially in smaller veins. This pain can be mitigated by pretreatment or mixing with intravenous lidocaine. Alternative formulations with a larger proportion of medium-chain triglycerides (as opposed to Intralipid) appear to have less pain on injection, possibly due to lower concentrations of free aqueous propofol. It appears to be safe for use in porphyria, and has not been known to trigger malignant hyperpyrexia. 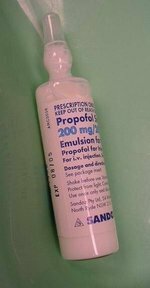 The elimination half-life of propofol has been estimated to be between 2-24 hours. However, its duration of clinical effect is much shorter because propofol is rapidly distributed into peripheral tissues. Propofol and Too Much Sulfite? To the Editor: It was with great interest that we read the letter from Dr. Langevin (October 1999) regarding the sulfite content of propofol. Dr.